The Perfect stocking stuffer for travelers on the go! Each kit includes everything you need to make two drinks (per kit!) in-flight or in the comfort of your own home, for a total of 12 drinks in this bundle. This is a great set to buy and give out one-at-a-time as gifts as needed! This Holiday Bundle gives you six cocktail kits. 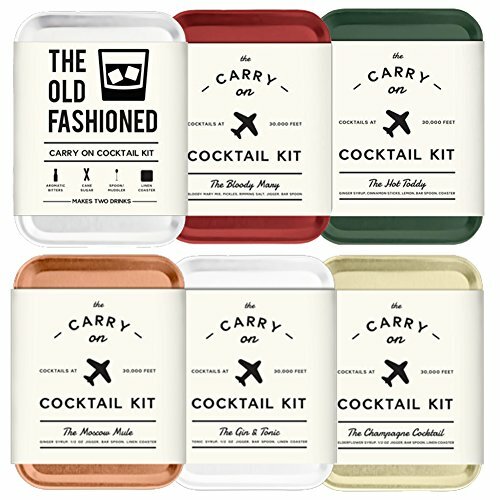 Each kit provides everything you need to craft two delicious Old Fashioned cocktails mid-flight! All you need to add is the hard stuff. Includes SIX great Carry On Cocktail Kits - Perfect for yourself of gift giving! Make an Old Fashioned mid-flight! Craft a Moscow Mule after takeoff! Stir a Gin and Tonic before landing! Warm up with a Hot Toddy on your airplane pillow ! Celebrate TSA approval with a Champagne cocktail! Relax with a Bloody Mary cocktail on the way home! GREAT STOCKING STUFFERS! SHIP DIRECTLY to your loved one using the "GIFT" options on Amazon Prime checkout! If you have any questions about this product by Sawdust + Oil, contact us by completing and submitting the form below. If you are looking for a specif part number, please include it with your message.